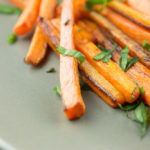 Toss the sweet potatoes with the olive oil and a pinch of salt and pepper. Lay on a baking sheet in a single layer. Bake for 35-40 minutes, until fries are lightly browned and tender.